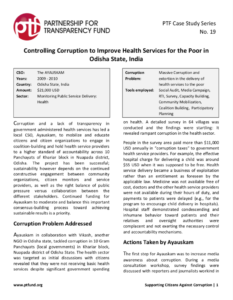 Corruption and a lack of transparency in government administered health services has led a local CSO, Ayauskam, to mobilize and educate citizens and citizen organizations to engage in coalition-building and hold health service providers to a higher standard of accountability across 10 Panchayats of Khariar block in Nuapada district, Odisha. The project has been successful; sustainability however depends on the continued constructive engagement between community organizations, citizen monitors and service providers, as well as the right balance of public pressure versus collaboration between the different stakeholders. Continued funding for Ayauskam to moderate and balance this important consensus-building process toward achieving sustainable results is a priority.